JASCO scientist Dr. Heloise Frouin‑Mouy and others study the acoustic occurrence and behaviour of ribbon seals in the Bering, Chukchi, and Beaufort Seas. The ribbon seal (Histriophoca fasciata) is easily recognized by the striking bands of white fur around its neck, flippers, and lower back. It inhabits only the icy waters of the Arctic and subartic parts of the North Pacific Ocean and adjacent Arctic seas. This seal species uses the edge of the sea ice to rear pups, breed, and molt in spring and early summer. From summer through late winter ribbon seals are pelagic, ranging in open-water areas. During this time they rarely haul-out and almost never approach land, so are rarely seen by humans. Due to the difficulty of studying these ice seals in their natural environment, there is little literature about them, and their distribution and movement patterns over large spatio-temporal scales are poorly understood. Knowledge of their distribution and movements is essential, not only to understand their basic ecology, but to implement appropriate conservation and management programs for this species. While analyzing acoustic data collected in the Chukchi Sea, JASCO Scientist Dr. Heloise Frouin-Mouy came across some ribbon seal calls and saw an opportunity to use existing records from passive acoustic monitoring to investigate the vocal behavior and to document the spatio-temporal distribution of this elusive species. In partnership with NOAA, Greeneridge Sciences, Inc, and University of Washington, she undertook a large-scale study that brought together scientists from private, academic, and governmental institutions who had been working on parallel projects. Data from these various groups were aggregated, yielding a year-long dataset (August 2012 to July 2013) that spans a large part of the geographic range of ribbon seals across the Bering, Chukchi and Beaufort Seas. The 53 acoustic recording sites spanned five zones within the Bering, Chukchi, and Beaufort Seas. Ribbon seal downsweep calls were detected on 30 of them and are color-coded by zone. Recorder sites without ribbon seal detections are white circles. This is Fig. 3 from their article in Polar Biology. The first objective of this study was to better understand the spatio-temporal distribution of ribbon seals and potentially identify areas of higher biological productivity and important marine habitats for this species. The video below shows the results of this part of the study. Distinct ribbon seal calls had been previously identified in data recorded during the spring in the Bering Sea and during the fall in the Chukchi Sea and on the Chukchi Plateau. Because the available recordings don’t cover the full distributional range of this species, this opens the question of whether this species does change its vocal behavior and/or call type usage between areas and/or seasons. A second objective of this study was therefore to describe the ribbon seal vocal repertoire and vocal behavior by examining the monthly patterns in their proportional use of each call type to infer the function of their calls in the Bering, Chukchi, and Beaufort Seas. And since the acoustic behavior in most pinniped species is closely tied to the breeding season, a third objective was to examine the daily call activity patterns of ribbon seals during and outside of the breeding season. 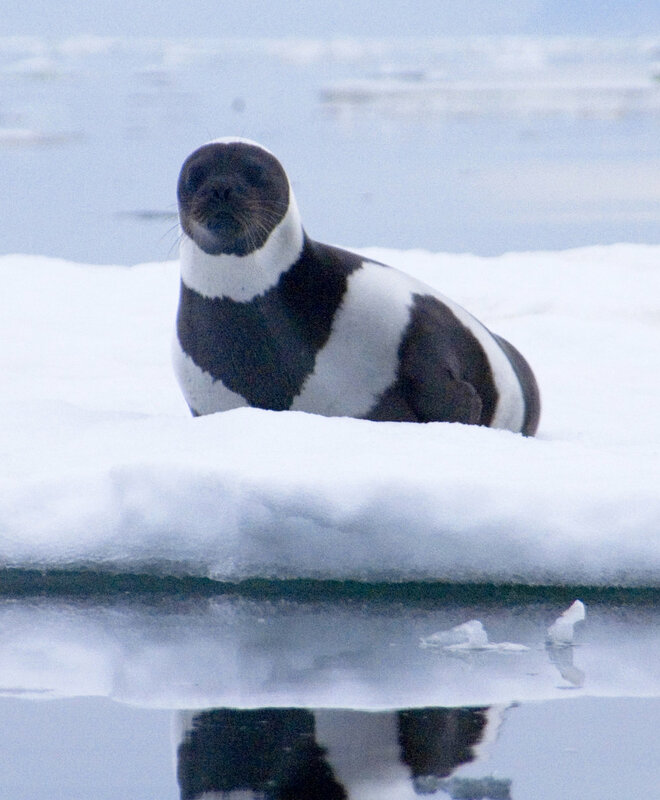 Ribbon seals are widely distributed at low densities on sea ice during the spring breeding season and are likely even more dispersed while pelagic during the summer and fall open-water seasons. One would therefore expect ribbon seal vocalizations to have high source levels if they are to be detected by other ribbon seals over large separations. A final objective of this study was thus to estimate the broadband source level of their most identifiable and common call known as the “downsweep”, an example of which is shown in the video below. Dr. Heloise Frouin-Mouy, a project scientist at JASCO, has been working with marine vertebrates for over 15 years, including Canadian harp, hooded, harbor, and grey seals, Arctic bearded and ribbon seals, western and eastern gray whales, loggerhead turtles, and blue, fin, and humpback whales. For her PhD she studied the impact of several contaminants on marine mammal health. Heloise joined JASCO in 2012 and has since collected and analyzed acoustic data on marine mammals and anthropogenic sounds.